Explanation: This scene from the early morning hours of July 3 looks out across the River Thames from the Westminster Bridge. Part of a luminous timelapse video (vimeo), the frame captures a sight familiar in London, the nighttime glow of the London Eye. 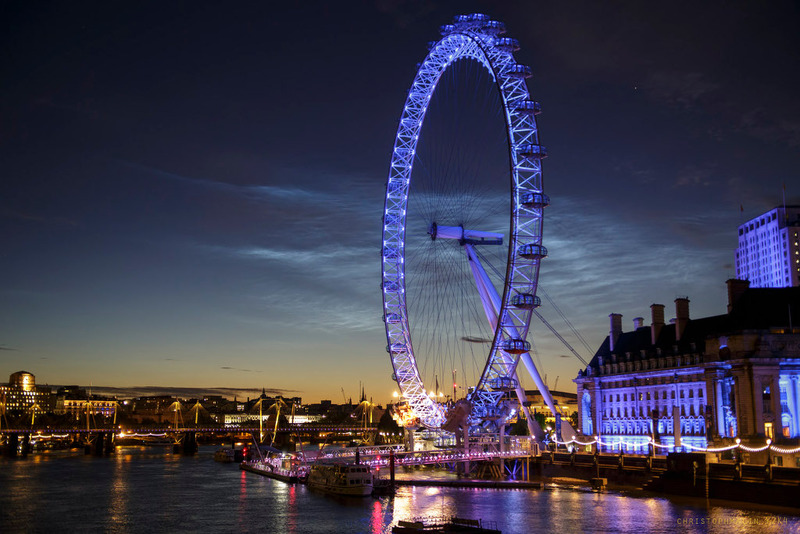 But a not-so-familiar sight is shining in the still dark sky above, widespread noctilucent clouds. From the edge of space, about 80 kilometres above Earth's surface, the icy clouds can still reflect sunlight even though the Sun itself is below the horizon as seen from the ground. Usually spotted at high latitudes in summer months the diaphanous apparitions are also known as polar mesospheric clouds. The seasonal clouds are understood to form as water vapour driven into the cold upper atmosphere condenses on the fine dust particles supplied by disintegrating meteors or volcanic ash. NASA's AIM mission provides daily projections of the noctilucent clouds as seen from space.